BASKETBALL SPOTLIGHT NEWS: Basketball Spotlight Feature: The Moore The Merrier! Basketball Spotlight Feature: The Moore The Merrier! 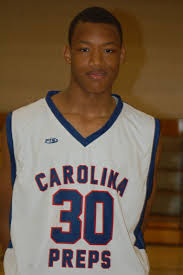 Wendell Moore caught our eyes in July when his dominant play help led the Carolina Preps to the AAU 6th Grade National Championship. His all around skills and motor are very rare for a player at such a young age. He not only finished as the #1 Player at the AAU Nationals but also topped our list as the #1 player overall in the country. Moore continued his hot play and made our rankings look nice with a MVP performance at the recent NYBL Top 20 All Star Game. During the game he showed his well rounded style by finishing with 10 and 8 boards. It’s still too early to predict if Wendell can run the table as the #1 player all the way through high school but he’s off to a good start. Stay tuned as Basketball Spotlight bring you more top players from around the United States.